BUSAN -- Universities need more governmental support to maintain and increase the quality of education and academic research as enrollment is expected to drop in line with Korea’s falling birthrate, university presidents attending a seminar said Friday. Already many universities are suffering financial difficulties, they said, and the trouble will only deepen, with the number of high school graduates projected to shrink. It has reached a point where self-help efforts alone can’t ensure survival of universities, they said. 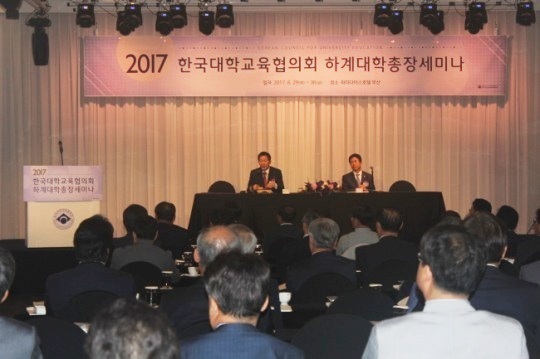 “Financial conditions, education environments and research conditions of universities here are worsening each year despite our efforts to overcome difficulties in running the schools,” the council’s head and president of Dankook University Chang Ho-sung said at the two-day forum hosted by the Korean Council for University Education in the southeastern coastal city of Busan. “Without the governmental support, universities cannot produce highly skilled manpower needed in the various sectors, this will affect the job market in the long run,” Chang added. Sahmyook University head Kim Sung-ik also urged the government to enact a higher education financing law to address the difficulty. “The college tuition cuts policy does not reflect rates of inflation, which led to colleges struggling to stem drops in overall enrollment fees. The government should come up with measures to finance them,” Kim added. The proportion of government assistance for higher education expenses here accounts for 29.3 percent, about 40 percent point less than the Organization for Economic Cooperation and Development’s average 69.7 percent, according to its data.